Conscious Awareness returns each’s power. Judgement/fear is a dis-empowered state. These are opposites. One allows you to act from your higher vision/you, the other is you acting/beliefs, from your lower dimensional/ego aspect. Choose. The 3rd Density was a reality, a frequency bandwidth, created out of a level of (un)consciousness. If your body is in 3D, it’s going to be pure hell. If you are holding onto anything, beliefs, things, people… this is fear/attachment and lack. Root chakra-based… heart closed/mind closed. No/little deep inner-connection on a Soul Level. Fear/control/judgment rule these realities that increase “collapse mode”. As the constructs for 3D timelines continue an accelerating process of dissolving/dismantling/deconstruction phase (template), the realities built on these go too. Judgement is an ego game of “blame/outside’s fault/I’m a victim” and complete disempowerment. This is a huge energy that all hold prior to physical body ascension can occur. It’s up to each to SEE this energy and choose not to play that lack game/program out anymore. The human ego LOVES to judge and be a victim to outside being the fault. This is pure separation and it perpetuates the old until all the judgement goes. The conscious being OBSERVES the judgment and the mentalities stemming from this and comes to realize the game involved, which is “I’m not taking responsibility for my own Energy and owning my own reality. Instead I’m going to blame and gossip and point the finger at that/them, because if I don’t, I actually look at myself and realize it’s my lack of power/connection”. Judgement carries the stories on and re-inforces the “belief”. Pre-judging is each creating an opinion on all and bringing forth these “pre-judgments” based upon something not of the current vibrational experience (presence), because of some program still playing inside that individual/collective. Judgement is PURE VICTIM mentalities/energy that loves to make everything “someone else’s” fault. Example: “I’m broke, they charge too much.” or “I’m not capable/they did this to me”. It’s an EXCUSE not to stand in your power and take responsibility for your own Energy/REALity as LOVE, abundant, infinite and Sovereign. There’s always a dualistic blame/fault/victim/perpetrator…. which perpetuates the 3rd/4th Density Experience…. which will become heavy, create chaos and take each to a “breaking point”. When instead, observing the judgment means we see it, yet it’s not our reality anymore. I awoke to observing many Collectives, Cosmic Energies and “what’s to come” for 3D/4D realities maintaining a level of unconscious programming still. I share for each to understand, that shifting/expanding our consciousness, completely shifts this as “reality”…. to an alternate/very different one. So, here we go: (3D/4D Consciousness). I’m making all as direct as possible. No fluffy stuff. Harshness means that those timelines/templates have collapsed and the experience is to clear the energy still held within. Hearts closed/minds closed… which means the only reality available has to be as strong or stronger to get the heart/mind open finally/again. This can be soft/beautiful or harsh/rough. Our energy/level of consciousness dictates this. Not self-accountable for own Energy (leaving from presence to “go off” and get caught up in something “outside”). There is a “caged animal syndrome” (my phrase) that occurs, when the human ego aspect gets boxed in or realities are collapsing/control no longer works. This will increase for those deeply unconscious and trying anything to avoid opening their hearts and standing in their power as LOVE. “Forced Change” is how the human ego experiences up-shifting and heart opening, because there is so much refusal/resistance energy held. Technically, on a Quantum Scale, it’s Energy relative and of a greater “force” to break those old constructs down and “break/dissolve” that energy…. yet the human aspect cannot understand this, because of the dis-empowered state of consciousness it lives in. This is going to increase as 3D templates go. 3D = All HELL breaks loose on a collective/individual level (3D Version of Earth too). Closing your eyes, going deep inside, pulling away on an energetic level and shifting/tuning in to a higher state of consciousness can assist with shifting the actual experience, unless “you waited” too long, then the physical may play itself out, because of the amount of energy still held inside. (Unconscious programming/separation/dualistic energy). 3D Energy has to fully clear. 4D is where all maintain “one foot in each reality” until all of this duality can clear on a physical level, for the (Light)Body to vibrate/Merkaba full activate (occurs over months/years), for Physical 5th Dimension to become HOME. 5D/5th Density and above – Opposite realities from 3D. Flourishing, vibrant, abundant and alive, because the BEings here don’t operate from fear/lack-based programming anymore. This is called Transcendence…. and the whole physical reality is an alternate dimension and different frequency bandwidths only visible as each elevates their consciousness to see (then experience NEW Earth). First in dream/meditative state, to expand each’s consciousness, open hearts/minds and DNA/body template to re-write/build itself according to Quantum Geometrics (non-linear). For Heaven to materialize, hell must dissolve inside. Hell was hidden for a long time. It started as an etheric thing, yet becomes a physical reality to held clear these energies/programs where they were housed in the physical body, often “undetected” for eons/years, masked by ignoring, pretending and suppression…. until no longer an option. 3D/4D/5D (and way above) are accessed through each’s body….. Learning how to open access and clear this deep seated programming is an immense process for us all. A complete re-education through higher consciousness practices and application is required. The whole body will go through a massive process to accomplish multi-dimensionality here. The physical body “weights” (anchors) each in the lower dimensional realms of unconsciousness (amnesia/veiled). Each must get their body’s vibration high enough to “leave” the lower dimensions/frequency bandwidths “once and for all”. 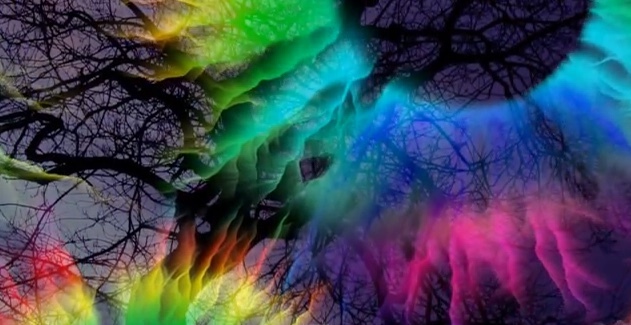 5D Light BEings… This is a frequency bandwidth emanating from Sacred Love and Respect. Judgment does not come into play here. If it does, then it’s not 5D. It’s lack programming again and each has shifted “back” into a 3D/4D Level of Consciousness again. Carrying “others” with your field… this is going to get “heavier”, meaning cutting those cords of attachment and “hanging on” will occur “faster”, because many were using each other to maintain/get through/get by… words don’t matter. The mentality/energy does. No more carrying others. Each has to stand on their own two feet (energetically), come into their own POWER and open their hearts fully… experiencing exactly what is necessary to assist with this. The more Light held, the more others love to attach, be in that energy and live off of that…. it’s easy, abundant, magical and happy…. yet if all are not wide open and contributing, there are distortions/imbalances and you won’t be able to “carry others” anymore… It will “get too heavy” and weigh on you. Literally, your body will put on weight…. You will be carrying “heavy” with your body and your field, and your field can’t spin in the direction/at the speed it must in order for you to expand…. if you are the one relying on someone else’s field/energy/anything, then you may notice them pulling away, shutting doors and ending relationships, closing out realities/timelines… your human will be shocked, even go to judgment or blame, when in essence it was YOUR ENERGY… so observe yourself and what you are transmitting out. Warp Speed and slowing all down to a halt: Quantum Jumping, Quantum Realities are at warp speed/the Speed of Light. Maneuvering and Mastering can only be done from WITHIN THE PRESENT MOMENT and functioning in Universal/Cosmic flow…. Zero Point Field is where all is CREATED FROM… if you are scattered, not present and separated off into other places, times, things… if you’ve attached to something outside or anything, when the geometrics/Light Codes for your current reality activate to change the structure of your reality, you won’t be aware of this and it will “appear” all is collapsing, because you are trying to “hold on” to something going… instead of embracing what’s newly/now available and ready to come forth, the moment your heart/mind are fully open and you are on-board with ALL OF YOU…. NEW EARTH IS QUANTUM…. multi-dimensionality is Quantum… there’s absolutely nothing linear here. We all have to learn how to function in non-linear states, from a Quantum State of Consciousness in order to Master the Physical here. This is through practice, applying much higher consciousness knowledge to your current reality, through the Light Encoded Teachings/Sharings available and created/shared to “make all easier” for those who VALUE this. It takes awhile to learn/understand how all works… as it’s all completely different than before. Your old ways won’t work…. and we all do have to choose NEW EARTH over Old Earth… at some point. The “sooner” we do this, the easier all is…. as all can align their entire reality on a Soul Level themselves…. instead of the “alternative” options that the ego aspect requires, due to refusal to open up to multi-dimensionality as a whole new “real existence” now. 3D = Ego Experience. Control. Narcissism. Fear. Judgment. Blame. No inner power/connection. 4D = Duality Experience/Transition phases while DNA repair/re-writing occurs. Higher Self becomes audible. “Other dimensions” (etheric realm) presents itself dependent on each’s awakening process (Battle of Armageddon between Heaven & Hell, Good and Evil, Dark & Light begins. Outside and inside until inside aligns fully, then outside can begin. NEW EARTH is beyond the 3D/4D Mentalities/Limits and Judgments, where bliss, magic, pure JOY, Harmony and infinite everything exists. It comes forth from within you…. as you awaken to your highest aspects/versions and START TO LIVE THIS FULLY NOW. Unity – Love – Consciousness is our NEW Way. Sharing, caring, respect, kindness, compassion, generosity… supporting, receiving as a vibrational response to each’s ENERGY, which is Quantum (non-linear)…. our entire reality is fully aligned with this. There is zero feeding the old, allowing the old to play out. We don’t “carry others” or tell them what to do. We allow all to decide their own reality to live out on whatever Earth they choose, whatever dimension/vibrational timeline. We don’t “criss-cross” like before. We see each’s purity, each’s abilities and each’s unconscious/conscious actions/energy CREATING REALITIES to occur and we honor this. We do have to separate all out, otherwise human ego aspects will impose and bring their karma/unconscious programs forth and dump them on our table/on our doorstep for us to “deal with”, which is an unconscious program on all’s part… where this is allowed to play out. I love you… you won’t see me writing on this anymore (unless it’s mega important for collectives), as my focus is on those who are embracing, ready and not playing the lack/judgment/blame/victim games anymore. My focus, as are all that I unite with, is NEW EARTH and Unity and our amazing realities we already live. My focus is supporting those in return, who have decided what is important and VALUE all as LOVE. My focus is fulfilling much higher roles/purposes here and we work daily to accomplish for all of humanity here. Those who truly value themselves, each other and are ready to live the most amazing realities too, are not arguing, fighting, judging and letting lack mentalities “control” their choices, because they understand that lack breeds more lack. Gratitude, abundance, appreciation and re-prioritizing creates and activates the highest timelines through the exchange of Light Codes to awaken within one/their field, for integration, application and living our highest vibrational DREAMS and Heaven on Earth fully… because we can. You won’t find us going small and catering to human lack programming…. because that’s Old Earth… which is “dead”. Literally… NEW EARTH IS VIBRANT, ALIVE, THRIVING and miraculous. Yet we all have to CHOOSE TO BE HERE… and all here… we have/did. NEW EARTH is not experiencing 3D/4D (Density/Dimensional) Realities, because they are relative to our own Levels of Consciousness held/Embodied…..
p.p.s. This article is not a judgment. It’s a Light Encoded Activation/Clearing to assist collectives with transcending the suffering that judgment creates/perpetuates, a Cosmic Multi-Dimensional Energy Report directly speaking to an Unconscious 3D/4D Program/Energy (Clearing Process) for all holding this still. This entry was posted in Uncategorized and tagged body in 3D is pure hell, collapse mode, create awareness, Intentional Consciousness Expansion, judgement is pure VICTIM metality, Lisa Trancendance Brown, love, you choose. Bookmark the permalink.